When the cat's away the mice will play ! 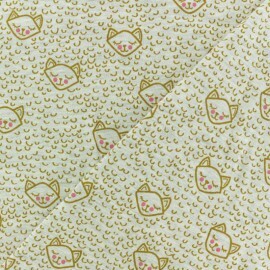 Adorable poplin cotton fabric, from Catitude collection designed by Dear Stella with pretty tiny mice patterns on a white background! 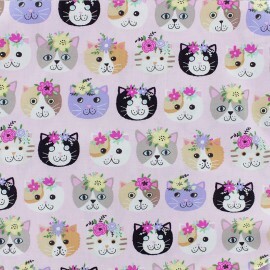 Fall for this fabric and make pretty dresses and blouses but also decorations for your kid room ! 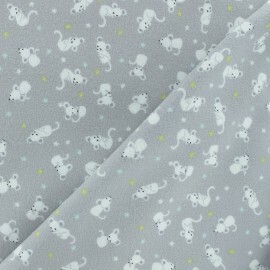 Make pretty pajamas with this grey Mouse flannel fabric, designed by Dear Stella. 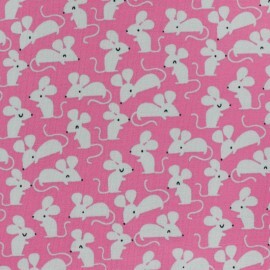 With its pretty tiny white mouse patterns, you will fall in love with this very comfortable and classic fabric, ideal for winter! 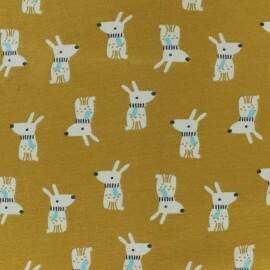 Very nice Fryett's dog coated cotton fabric with pretty dogs. 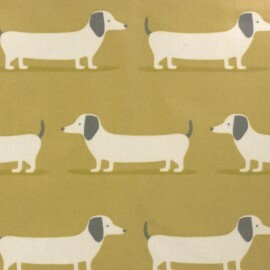 Fall for this beautiful cotton fabric, with a mustard yellow background and a glossy finish. 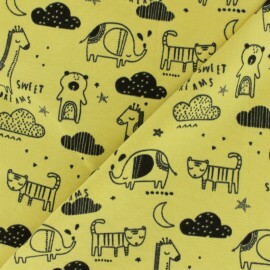 Decorate your home or make accessories with this coated cotton fabric. 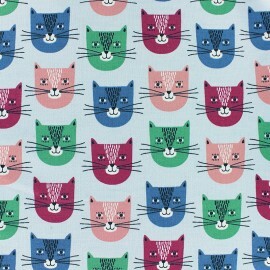 Discover this adorable Deli-cats 100% cretonne cotton fabric. 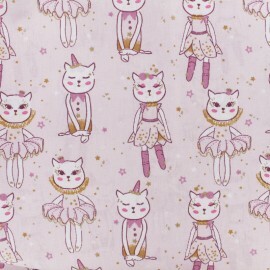 Fall for this pretty cotton fabric with pretty disguised cats on a light pink background with tiny gold details ! Flexible and easy to sew, this Oeko-Tex certified cotton fabric will suit to all your desires for clothing or decoration creations. 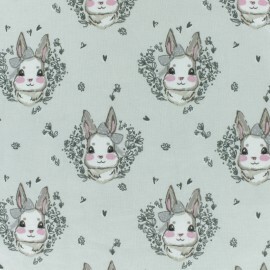 Discover this adorable Rabbit 100% cretonne cotton fabric. 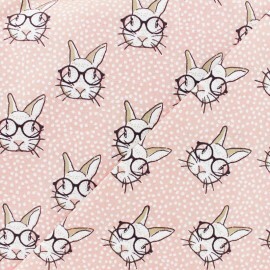 Fall for this pretty cotton fabric with pretty rabbits with glasses on a pink background with white dots! Flexible and easy to sew, this Oeko-Tex certified cotton fabric will suit to all your desires for clothing or decoration creations. 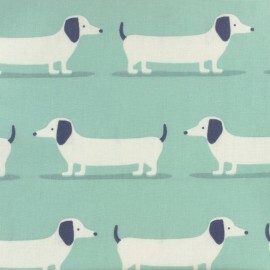 Discover this adorable Doggy 100% cretonne cotton fabric. 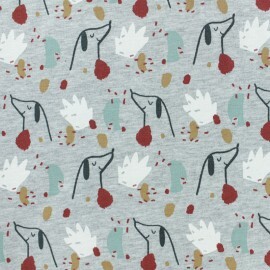 Fall for this pretty cotton fabric with dog and colorful stain patterns on a white background ! Flexible and easy to sew, this Oeko-Tex certified cotton fabric will suit to all your desires for clothing or decoration creations. 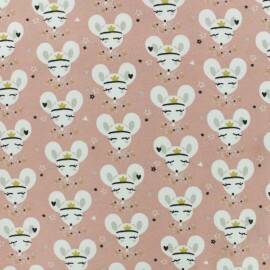 Very pretty mouse cotton jersey fabric patterned with a pink background. 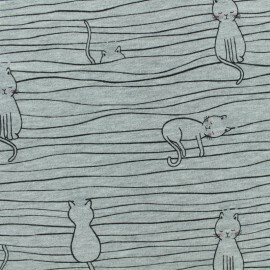 We love this jersey fabric, Oeko-Tex certified, with pretty tiny grey mouse with large ears. 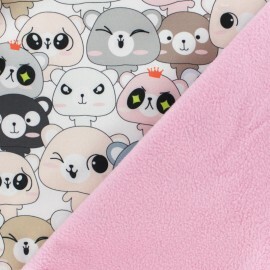 Flexible and resistant jersey fabric is ideal for making t-shirts, pajamas, bodysuits or dress. An original fabric that will suit to the whole family. Fall for this colorful and graphic 100% cotton cretonne fabric. 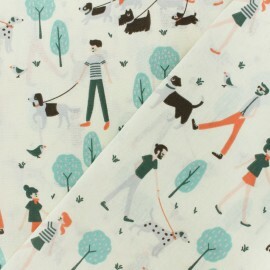 Flexible and easy to sew, this Park walk fabric with patterns of dogs walking with their masters on a park on a raw background will suit to all your desires for clothing or decoration creations. High-quality Poppy fabrics, Oeko-Tex certified with trendy and colorful patterns. 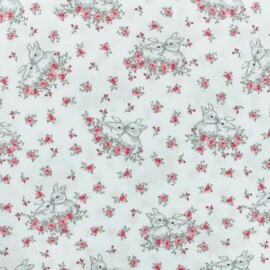 Fall for this Charming Bunnies cotton poplin fabric and its pretty white rabbits and pink roses patterns on a white background. Make pretty clothes and accessories for kids! 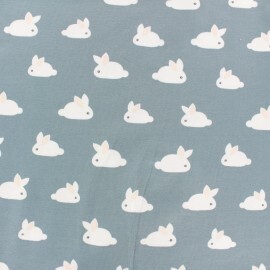 Adorable White rabbit cotton jersey fabric with pretty tiny rabbits on a bluish grey background. 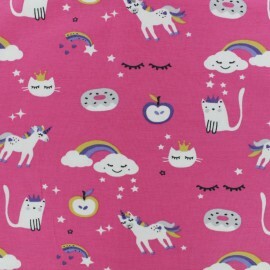 Make t-shirts for adults or kids, colorful dresses and leggings in this resistant and comfortable jersey fabric! 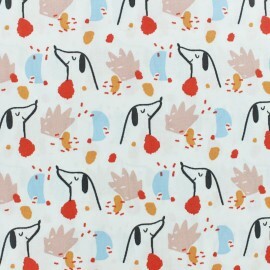 Very nice Fryett's dog coated cotton fabric with pretty dogs. 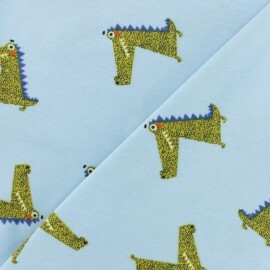 Fall for this beautiful cotton fabric, with a turquoise blue background and a glossy finish. 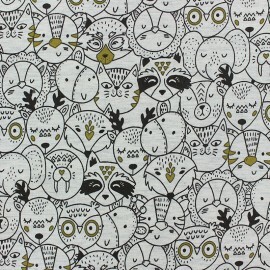 Decorate your home or make accessories with this coated cotton fabric. 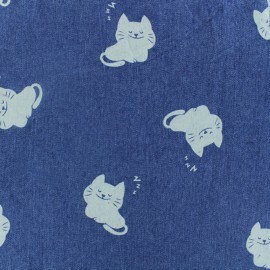 Very pretty cotton jersey fabric patterned with a bluish grey background. 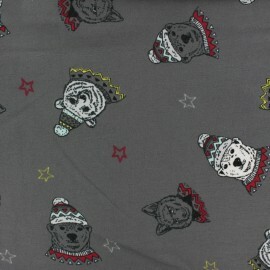 We love this Winter spirit jersey fabric, Oeko-Tex certified, with polar bears dogs with winter clothes. 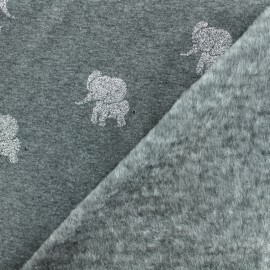 Flexible and resistant jersey fabric is ideal for making t-shirts, pajamas, bodysuits or dress. A original fabric that will suit to the whole family. 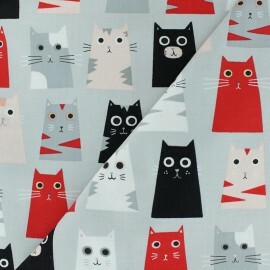 Very pretty cotton jersey fabric patterned with a dark grey background. 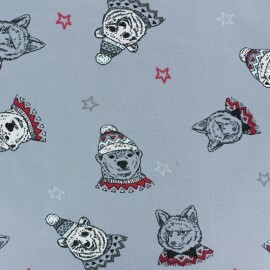 We love this Winter spirit jersey fabric, Oeko-Tex certified, with polar bears dogs with winter clothes. 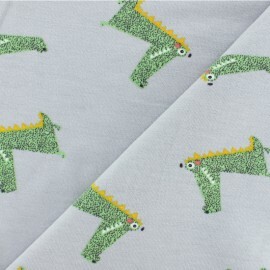 Flexible and resistant jersey fabric is ideal for making t-shirts, pajamas, bodysuits or dress. A original fabric that will suit to the whole family. 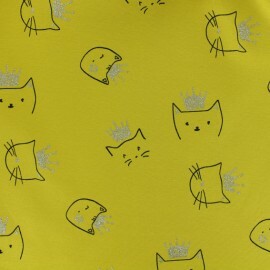 Adorable french terry fabric with prints of pretty yellow Sleeping cats on a mottled raw background. 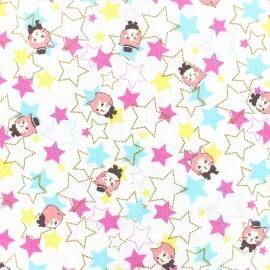 This fabric is very soft and resistant. 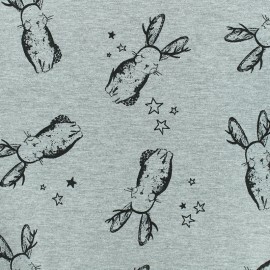 Make some sweat-shirts for the whole family and also pretty dresses or pants ! 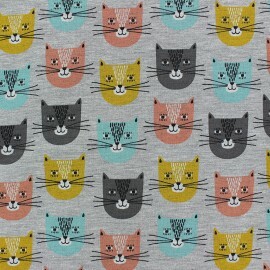 Very pretty cotton jersey fabric patterned with a mottled grey background. 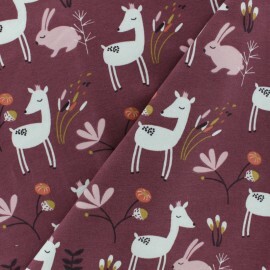 We love this Poetic Rabbit fabric, Oeko-Tex certified, with pretty rabbits with reindeer antlers, flexible and resistant jersey fabric ideal for making t-shirts, pajamas, bodysuits or dress. A original fabric that will suit to the whole family. 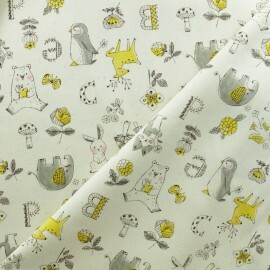 Very pretty cotton jersey fabric patterned on a mustard yellow background. 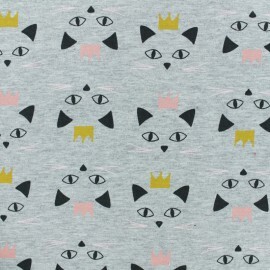 We love this cat printed fabric with pretty cat heads with silver glittery details, flexible and resistant jersey fabric ideal for making t-shirts, pajamas, bodysuits or dress. A original fabric that will suit to the whole family. 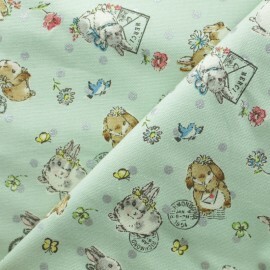 Fall in a poetic and childish universe with this Kokka cotton canvas fabric, from Sweet Bunnies Collection with pretty patterns of rabbits on a light green background with silver dots. Imagine nice curtains in a child's room or a cute canvas backpack to carry the school's matter! 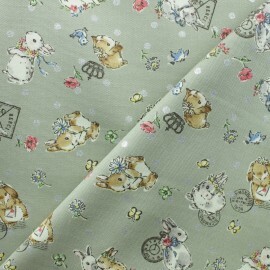 Fall in a poetic and childish universe with this Kokka cotton canvas fabric, from Sweet Bunnies Collection with pretty patterns of rabbits on a green grey background with silver dots. Imagine nice curtains in a child's room or a cute canvas backpack to carry the school's matter! 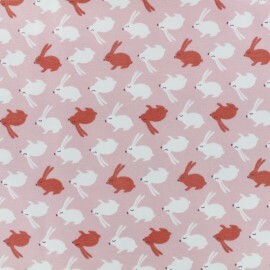 Fall in a poetic and childish universe with this Kokka cotton canvas fabric, from Sweet Bunnies Collection with pretty patterns of rabbits on a light pink background with silver dots. Imagine nice curtains in a child's room or a cute canvas backpack to carry the school's matter! 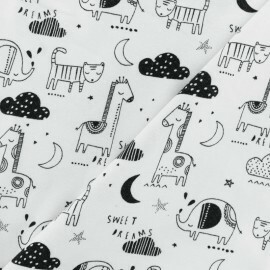 Fall in a poetic and childish universe with this Kokka cotton canvas fabric, from Little Animals Collection. Imagine nice curtains in a child's room or a cute canvas backpack to carry the school's matter! 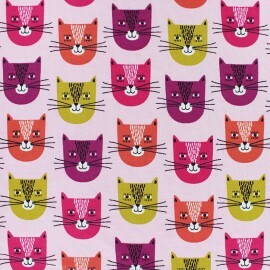 Fall in love with this Robert Kaufmann cotton fabric panel and make 9 funny animal cushions ! 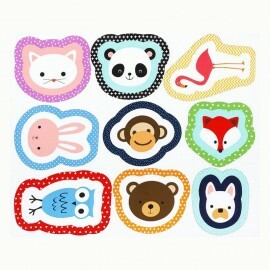 Create cushions with your favorite animals: monkey, fox, bulldog, owl or flamingo ... Add a touch of fun in a child's room with its cushions, perfect for a birth gift. For your winter vests or rain jackets, fall in love with our softshell waterproof fabrics. With one side resistant and windproof, it resists the light rain while remaining breathable. On the other side, a comfortable and warm pink fleece side. 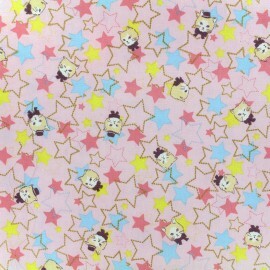 Discover the Kawai softshell fabric with pretty kawai japanese manga hamsters on a light pink background. 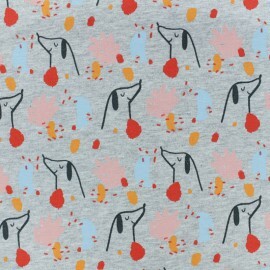 Lovely Doggy light french terry fabric with a nice colorful dog patterns on a mottled grey background ! 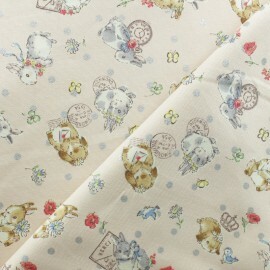 This lovely elastic fabric will be perfect for all types of clothes : tee-shirt, dress, skirt, jogging... Very confortable ! 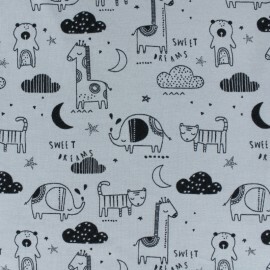 Lovely Zeby light french terry fabric with a nice Zebra patterns on a mottled grey background ! 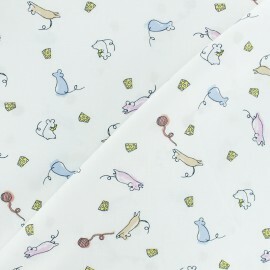 This lovely elastic fabric will be perfect for all types of clothes : tee-shirt, dress, skirt, jogging... Very confortable !